Click Profile button and click the Output File Format drop list. You can choose any one of For spoken word, For streaming music, Common WAV, MP3, AAC(m4a) and AAC(m4b) as the output format. 2. 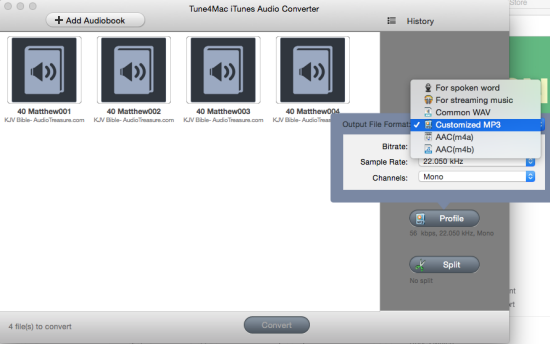 Select For streaming music as output format, the file extension is m4a. Only MP3, AAC(m4a) and AAC(m4b) support customized the profile parameters as follows. Bitrate: The bitrate determines the amount of information stored in the audio. A higher bitrate will result in clearer audio, but comes at the expense of file size. Sample Rate: The sample rate determines the resolution of the audio. The higher the sampling rate is, the clearer the audio is. However, this comes at an expense of a bigger file size. Auto is set as the default of 16.000 kHz. Channels: The channels is fixed the iTunes Music track, you can choose Stereo, Mono as you like.